Avengers: Age of Ultron begins with a great and sweeping action sequence and tends to bring our focus to the question of if what these heroes are doing is actually not a good thing. That starts a long series of points telling us over and over that war and destruction will always cost lives- and sometimes trying to prevent that will cost just as many lives. They've given us wonderfully long tracking shots of the interplay between the team's combat interactions, with snippets of banter to keep the pace going. They show the cost of being a hero and the divide growing between their ideologies. Each character has much more wit and humor in the dialog than the first Avengers did. So much so, that at times it felt as though they were just being said as filler. Many of them were beginning to sound too alike. Thor's bravado and Asgardian flavor has been grounded to the Midgardian station, even Captain America's joke's feel too soon for a man displaced in time. His situation does get addressed and serves as a running joke about Cap's distaste for "language," but not enough to make him really stand outside the group. Though I do have to say there was a LOT of good humor despite the complaint, like the "Elevator is not worthy" line. Ultron damn near steals the show even though it seemed as if he was being completely mishandled in some scenes. His anger and absurd line about fixing Klaw's arm was great, and my personal favorite part of the film is when Hulk jumps into the Quinjet as Ultron is attempting to flee- and off screen you here Ultron say, "Oh, for god's sake!" Then he is flung out the back of the plane. A perfect reaction. As a nice change of pace, they did give some extra backstory and potential flaws shown through Scarlet Witch's powers. It also gave Hawkeye a much larger role instead of being the joke of the team. This movie also holds the best Stan Lee cameo to date. He barely holds his own against some ancient alcohol Thor has at a party... "Excelsior...!" Don Cheadle's character James Rhodes/War Machine makes a joke at a party about a story killing with the normal people, but not being a hit with either Thor or Iron Man. That works as a frame for most of the movie. There's a ton of things we've seen already, and an overabundance of fan service to the point of over stuffing the damn movie. We have the new bad guy, the threat of human extinction, and cameos galore. What we don't have is something really new. James Spader's Ultron is created and instantly has a plan to fix humanity. Protection by elimination. I can deal with that. What I don't understand is how criminally underutilized the character was. 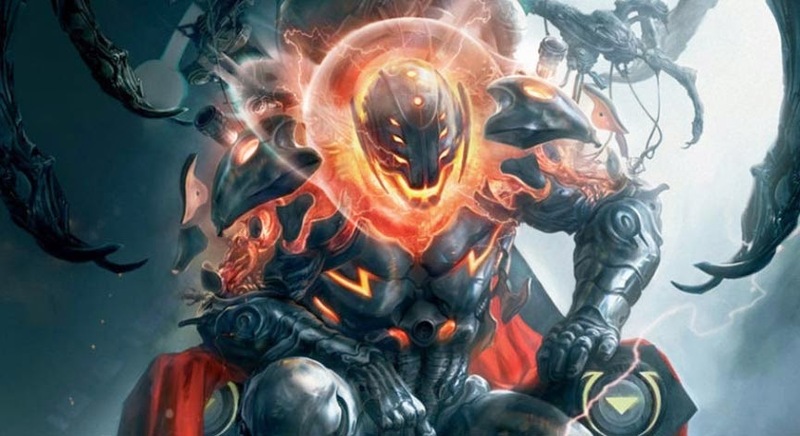 In the end he's in all his duplicates, but why wouldn't someone as smart as Ultron have a back up somewhere? When he upgrades himself I would've expected something much more interesting to come out, like the picture I included below from the cover of an issue of Annihilation Conquest. Instead they give us a thicker Ultron, which I thought looked worse than his original look. Even Iron Man makes a comment about him looking puffy. Even the Ultron drones looked better. The one big thing that really, really bothered me a lot was the odd and somewhat forced budding relationship between Hulk/Banner and Black Widow. It really felt completely unnecessary. Just taking up extra time that could've been shaved down and thus tightening up the story. This thread of story could've been cut down a lot of wasted space. Seriously, it felt so damn forced. There was however, an interesting, but nearly useless bit tied to this subplot about Black Widow being rendered sterile as part of her "training." Once, again, it doesn't really matter to the whole of the film. I mean did anyone wonder what the Hulk's nightmare was? Nope, because it wasn't required at all, and thus not shown. Another problematic topic was the introduction of the twins, Quicksilver and Scarlet Witch. The new origin story makes sense due to the fact they can't be mutants, as Fox owns the film rights to all mutants- and puts a nice tie in to the Agents of S.H.I.E.L.D. show. It seemed like Quicksilver was there to give us a surprise death instead of the neon-sign-like hints of death all pointing directly at Hawkeye's face. They kind of appear shoe-horned into the story to give Ultron some lackeys. What may have been better was if he simply discussed things with his other selves. What the film does as a whole, aside from absurdly huge action shots, is set up a ton for future Marvel films. The end shows the current Avengers being torn apart and going their own ways, whilst simultaneously setting up for a new Avengers team made up of previously supporting characters. It begins the ominous coming of Ragnarok for Thor, Hulk's disappearance as he poses a threat to humanity wherever he goes, and even setting up Klaw to be a villain in Wakanda for Black Panther's own film. But most importantly, this marks the moment in time when Thanos himself steps up to take action where all his machinations had previously failed through pawns, he has finally decided to do things himself. The abrupt and unfinished statement by Captain America at the end, "Avengers a...," is really the best way to summarize the entire film. It definitely wasn't bad, but it really could have been much better. It seems slightly incomplete, and when it comes down to it, Avengers: Age of Ultron generally felt more like a segue film, a metaphorical launchpad for other films to spring off of, than the Star Wars: Empire Strikes Back sequel it truly could have been. It was still quite enjoyable, and I'll definitely still buy it because it's a popcorn-munching action treat at heart. Now to wait for Ant-Man which I believe will be a better overall film than this was probably due to it not having 20 main characters crammed into a single film.